1, 2 or 3-part nutrients? A balanced spectrum of the essential nutrients (as specified in Table 7.20) can be incorporated into either a 1-part, 2-part or 3-part package. Most 2 & 3-part brands provide adequate levels of macro-nutrients and trace elements. The 2 or 3-part packaging format is often deemed necessary by manufacturers to avoid stability/ compatibility problems between certain nutrient species when present in the same bottle (Fig 7.1). As such, the nutrients are strategically distributed among each part. Most importantly, the calcium is kept separatfrom the sulfate. In a 2-part nutrient, calcium is normally in part ‘A’, and the sulfate is in part ‘B’. 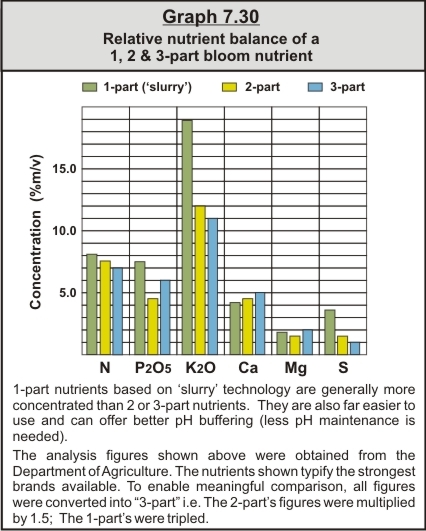 When created in the form of a liquid “slurry”, a 1-part is able to provide superior levels of macro-nutrients than 2 & 3-part nutrients (Graph 7.30). The “slurry” is a fully soluble suspension of mainly calcium sulfate (CaSO4) within a solution containing the balance of necessary macro-nutrients and trace elements (Fig 7.2). The use of a slurry enables the manufacturer to exploit the low solubility of calcium sulfate to squeeze more nutrient elements into a given volume than is possible with 2 & 3-parts. Growers must be aware that clear, fully soluble 1-parts not based on slurry technology are typically deficient in sulfate (S). Manufacturers reduce the amount of sulfate to avoid the formation of the crystalline calcium sulfate precipitate which would otherwise form (Fig 7.1). An alternative strategy used to supply ‘some’ sulfate, is to reduce the overall concentration of calcium. Which is best: 1, 2 or 3-part nutrients? If ease-of-use is desirable then a slurry type 1-part should be used. In addition to this, 'slurry' type 1-parts usually provide a superior nutrient balance than 2 or 3-part nutrients. Growers must be careful when using 2 and 3-part nutrients. Their performance will be reduced when specific dosing guidelines are not followed. For example, the separate parts should never be combined in too little water. It is also crucial to add the correct amount of each part (Fig 7.3).